Southern Africa has been affected in recent months by misinformation concerning travel to the entire continent, most of it due to the Ebola breakout in Western Africa, creating a hesitation for future travel planning. In conjunction with the campaign, numerous SAA tour operators and travel service providers are promoting very affordable packages and unique value-added offers to South Africa, Botswana, Zimbabwe, Zambia and other destinations in the region. 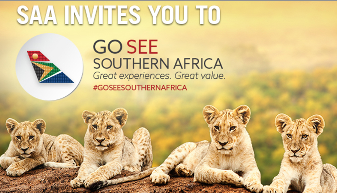 South African Airways (SAA) launched the �Go See Southern Africa� campaign for both the travel trade and consumers in North America. The collaborative campaign includes participation from leading tour operators, destination tourism organizations, hotels and safari lodges to generate increased awareness on travel to Southern Africa. �Now is a great time to explore Southern Africa with the extremely favorable exchange rate for the U.S. dollar and the very affordable offers that are being promoted by SAA and our participating tourism partners in North America,� said Marc Cavaliere, executive vice president for SAA in North America. SOUTH Africa will head the United Nations panel tasked with enhancing civil aviation security around the world. Representing the country as chair of the International Civil Aviation Organisation�s ICAO Aviation Security Panel will be Poppy Khoza� the director of the South African Civil Aviation Authority (CAA). Ms Khoza will be the first woman to take up the position. "The appointment comes just months after the United States and the European Union have given their thumbs up to South Africa�s aviation regulatory system on aviation and air cargo security�" according to a CAA statement released on Wednesday. -identifying new and emerging threats and developing appropriate mitigating measures. "The appointment is a demonstration of trust and faith by the global aviation community in South Africa�s capabilities on aviation matters and specifically aviation security�" Ms Khoza said. "It is certainly an enormous challenge; but a challenge that is surmountable. This move bodes well for the advancement of the transformation agenda which must continue as women play a meaningful role in all sectors previously dominated by men." Airline wins "Best Airline in Africa" and "Best Business Class to Africa." South African Airways (SAA) has been honored by Business Traveler Magazine�s readers, being chosen as �Best Business Class to Africa� and �Best Airline in Africa� in the magazine�s annual survey. The magazine presented SAA with the award at its ceremony held on Jan. 10th in New York City, recognizing the airline for its consistently high-quality service that keeps it in the world-class category and best in the region year after year. A group of key partners were on hand with SAA�s Executive Vice President of North America, Todd Neuman, as he accepted the award alongside other SAA executives. South African Airways� daily non-stop flight from New York to Johannesburg, and its direct services from Washington (with a short stop in Dakar, Senegal) provide excellent connection opportunities to destinations throughout the airline�s extensive route network on the African continent. Enhancements have been made to the airline�s Premium Business Class service, including augmented bedding for its 180� flatbed seats, and an expanded programming selection for its individual audio/visual entertainment systems. It is also featuring meal selections from South African star chef Benny Masekwameng, a judge on South Africa�s Master Chef TV series. Earlier this year the airline also accepted the Skytrax World Airline Awards for Best Airline in Africa for the 10th consecutive year and the Best Staff Service in Africa for the 3rd consecutive year. South African Airways features daily nonstop service from the U.S. to South Africa with morning departures from New York JFK and afternoon direct service from Washington Dulles (with a stop in Dakar, Senegal) that offer travel convenience and award-winning service. Travelers in Premium Business Class enjoy 180� fully flat-bed seats, and in Economy Class enjoy the most legroom versus competitors. Every seat on board offers an individual on-demand entertainment system, plush pillow, warm blanket and amenity kit. SAA�s unrivaled network, featuring seamless connections to nearly 20 destinations within South Africa, and more than 25 cities across the rest of the continent, makes the airline the savvy traveler�s �gateway to Africa.� To complement this network, a world of privileges awaits those who join Voyager, South African Airways� premier mileage program. To sign up, visit http://www.flysaa.com, and link to the Voyager icon. As a Star Alliance member, South African Airways is able to offer its customers 1,356 destinations in 193 countries and more than 21,500 flights daily, including convenient connections from more than 25 cities in the U.S. through code share service with Star Alliance member United Airlines. Members of United�s, US Airways� and Air Canada�s frequent traveler programs are able to earn and redeem miles on all SAA flights. For more information on South African Airways, please call (800) 722-9675 or visit http://www.flysaa.com, where travelers can sign up to be notified of other great travel deals and vacation packages. For information about South Africa, visit http://www.southafrica.net. For Lauderdale, FL (April 17, 2013) - South African Airways (SAA), Africa's most awarded airline, was honoured with the "Top Producing Airline" award at the 4th Annual South African Tourism Ubuntu Awards in New York City on April 15th. The Ubuntu Awards celebrate travel providers that excel at promoting travel to South Africa. The Airline was recognized for contributing to the growth of travel to the destination through a number of initiatives, as well as its extensive route networks that offers the most flights from the U.S. to South Africa, and an array of destination to connect to from its hub in Johannesburg. Its award-winning on-board service and luxurious lounges complement its route network, providing North American customers with a world-class product that makes one of the longest flits in the world fly by. And its existent and new code share partnerships with United Airlines, JetBlue Airways, US Airways and Air Canada provide a large number of convening options for travellers originating from throughout North America. Behind the scenes, the airline's vigorous promotion of tourism to South Africa through marketing, public relations and trade support resulted in the destination receiving added exposure that complemented South African Tourism's efforts. As part of Team South Africa, the airline also partners with the South African diplomatic corps and related organizations, such as Wines of South Africa, to champion cultural and industry efforts, and it supports a number of charitable organizations that perform work in South Africa. "This award is a true testament to the commitment, support and collaboration between South African Tourism and SAA in promoting the destination over the past year," said Todd Neuman, executive vice president, North America, for South African Airways. "As South Africa's national airline, we take our mission of promoting travel to South Africa seriously, and we're pleased that SA Tourism has recognized SAA in this regard. We know that there was competition for this award, and so we're especially proud of this acknowledgment. Most tourists from abroad can expect long air trips to the southern end of Africa. Different airlines fly different routes, but these are typical flying times using the national carrier, South African Airways. The times include refuelling stops where appropriate. For those flying onward from Johannesburg, Cape Town and Port Elizabeth are a two hour flight further south, and Durban is just under one hour to the south east.